It seems crazy that I haven’t written about cider yet. If you know me in person, you know I can talk for hours about it. This fall, I’ve spent my weekends volunteering at my favorite cidery, fermenting my own, and, of course, drinking the stuff. When I speak of cider, I mean dry, sparkling, hard cider – nothing too sweet. A good hard cider should be reminiscent of a sparkling white wine or a sour beer, not apple juice. Cider is naturally gluten-free and one of healthiest forms of alcohol, with antioxidant levels the same as red wine. But the taste alone is enough to make it your new favorite drink. My personal mission is to spread the word of real cider; to crowd out what’s syrupy sweet and replace it with the good stuff. Once upon a time, hard cider was America’s most popular drink. President John Adams was known to drink a tankard every single morning of his life. Ben Franklin was quoted saying, “It’s indeed bad to eat apples, it’s better to turn them all into cider.” But when prohibition came around, the apple trees died out. And once it was repealed, it was far easier and cheaper to start making beer using grain. So just like that, cider fell from popularity. Only recently is it making a resurgence, but unfortunately, most ciders on the market are far from what our forefathers drank. Instead of the real thing, you’ll find apple concentrate and high fructose corn syrup. I highly recommend you stay away from those impostors. What seemed like an innocent purchase at Headhouse Square Farmer’s Market has seriously changed my life for the better. Frecon Cider is what opened my eyes to what cider can and should be. Frecon comes from a family-owned fruit farm in Boyerstown, PA that devised an ingenious use for their extra apples. They have three main ciders and a few special releases, all in the range of 6-10% alcohol. They are very dry, complex, funky, with a slight taste of apples. Their Farmhouse Sour might be my all-time favorite. If you’re a craft beer lover (and particularly sour beers), these are the ciders to chose. Find them at their store in Boyerstown, the Foodery at 17th and Sansom, or at Philadelphia area farmer’s markets during the season. Jack’s Original Hard Cider is my go-to when drinking a few. If everyone else is drinking beer at a party, you’ll find me with a can of Jack’s in hand. Jack’s is dry, clean, and crisp, with effervescence that will remind you of a champagne. One of my the best things about Jack’s is that somehow, the 12 oz can contains 5.5% alcohol and only 100 calories. Lighter than most light beers, but way more delicious. Jack’s is made at Hauser Estate Winery in Biglerville, PA, a partially solar-powered, eco-conscious facility. You can pick up Jack’s at stores throughout Pennsylvania, New Jersey, Maryland, Virginia, and Georgia – including local Philadelphia distributors and Wegmans. If you live in Philadelphia, you’re probably familiar with Philadelphia Brewing Company. They make great beer, and now, great cider. I thank them for that. Commonwealth’s three ciders include Traditional Dry, Razzberet Tart, and Gregarious Ginger. The Razzberet is sharp and fruity, without being sweet. The Ginger is super spicy and incredibly satisfying, boasting only 1 gram of sugar. 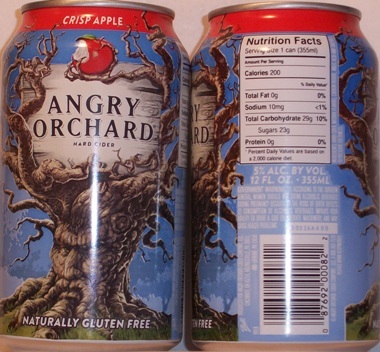 To put that into perspective, Angry Orchard Crisp Apple contains a cloying 23 grams. You can find Commonwealth the same place you find Kenzinger – at the PBC Brewery in Kensington and most distributors throughout Pennsylvania. I’m constantly seeking out new ciders and learning all I can. There’s no doubt you will hear more about my adventures on the farm and in fermentation. And if you want to know what I’m drinking in the meantime, you can find me on Untappd (@risanicole) racking up those Johnny Appleseed badges.